Batman was one of those shows it did not take much 'brain power' to enjoy! Batman and Robin might have been the headliners, but it was the villians that stole the show, especdially the big four, Riddler, Joken, Penguin and, especiallt for us red blooded American boys (I was 22 at the time), Catwoman! 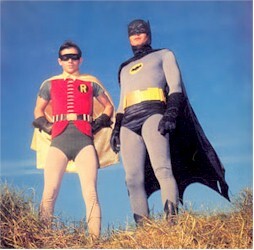 The only thing good about the show was the color.Batman and Robin acted like a pair of retarts. 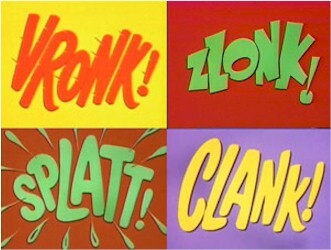 There's a YouTube video out there that cobbles together a zillion of Robin's "Holy ____, Caped Crusader!" into some four minutes... Worth a search! My favorite moment on the show, though, was this one time where The Riddler had left a clue by having a guy skywrite it for them... Scrambled! Undaunted, Batman reaches to his Bat-belt and pulls out a canister... "Robin, I'll solve this using my emergency can of... Alphabat Soup!" I was in 3rd grade when our substitute teacher asked if anyone had seen the new show "Batman" the night before. Everyone raised their hand and when she described the colors of his suit, the bats on the wheels of his car etc., we were amazed. Nobody in any of our neighborhoods had a color TV back then.